Funding for the BBC's arts coverage will go up by 20%, the broadcaster's director general will announce later. Tony Hall - who used to run the Royal Opera House - says he wants to return the arts to the corporation's "heart". It will mean plays, art exhibitions and more live music from around the UK being broadcast on the BBC. Among Lord Hall's proposals are a new "BBC Arts at" brand and new television series fronted by historian Simon Schama and broadcaster Andrew Marr. The director general, formerly the BBC's head of news, returned to the corporation following the Jimmy Savile scandal. He wants to see the BBC collaborate more with arts institutions around the country. 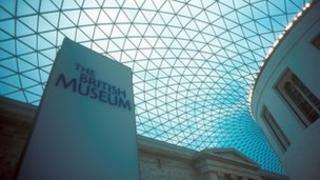 In a speech on Tuesday he is expected to announce new partnerships with London's British Museum, the Tate and the Manchester International Festival. The plans mean that more opening nights, major exhibitions and arts events will be shown live on television. An experimental digital service, known as The Space and developed by the BBC and Arts Council England, is also due to be relaunched in 2014. "Arts programming sits right at the heart of the BBC and is a vital part of who we are, but I want us to to be much more ambitious," Lord Hall said. "We need to showcase more of the incredible talent that this country has to offer to the widest possible audiences." The BBC's arts correspondent David Sillito said Lord Hall is keen to "return the BBC back to the founding principles of its first director general John Reith to inform, educate and entertain". "We already know a few of the details of today's speech but this is being presented as something rather broader, an outline of Lord Hall's vision of the future," he said. An enhanced iPlayer, allowing users to personalise their viewing and listening choices, is expected to be announced. Lord Hall is also due to announce major new television series featuring two faces familiar to BBC audiences. Simon Schama will front a five-part series in partnership with the National Portrait Gallery, exploring the history of Britain through portraiture. A series looking at the greatest writers in Scotland will be presented by journalist Andrew Marr. And there will be a series of six BBC One programmes seeking to uncover the "hidden heroes" of British art, with 10 amateurs competing for the title of Britain's best artist. The announcement is part of the director general's new strategy for the BBC and comes as the corporation is in the process of cutting 2,000 jobs by 2017 after the freezing of the licence fee.